Kirk Battle is an author who lives in South Carolina. Scroll down to learn more about each book or click on the image to purchase online. Historical Fiction set in Reconstruction South. In the wake of the Civil War, a group of widows and freed slaves, bishops and soldiers, unite to rebuild a school in Sewanee, Tennessee. Some have come to enjoy their newfound freedom while others must find meaning in their losses. Over the next twenty years, they will navigate Reconstruction politics and social upheaval to found the University of the South. Told from eight perspectives—freed slaves, Confederate veterans, widows, students—These Hallowed Halls is a detailed depiction of what it takes to build a dream in a new world. A futuristic satire set in Charleston, South Carolina. In a world where women are in power and men are struggling to find a new identity, apprentice space lawyer Lane is about to find out that change has a heavy price. A utopian world so perfect that the government knows where you are and what you are doing every minute, one of his clients has gone missing. Now it’s Lane’s job to find her. Caught in a hostile landscape of male alliances and powerful matriarchs, the line between the virtual and the real is becoming harder and harder to identify as Lane’s world is turned upside down. When he discovers that his client is involved with a faster than light (FTL) travel device, he opens a Pandora’s box of conflicting, hidden agendas. As the case becomes more confusing and reality begins to mirror the virtual world, the future hangs in the balance as Lane fights to solve the mystery and prove his worth as a true space lawyer. Mystery novels set in a harsh world of vampires and the recently cured. When Sam Shade awakens in a brightly lit hospital room he is horrified to discover he has been cured of his vampirism. Caught between betraying his friends and helping the people who despise him, Sam is the first one blamed when an ancient holy book goes missing that is the key to fighting the undead. Racing against time, Sam must find out who did it before either side catches him. Lovecraftian horror set in antebellum Charleston. A student takes a break from his studies at Miskatonic University to embark on an icy voyage, only to stumble upon the world of cosmic horror. The trip turns South and the narrator eventually finds himself caught between the brutal realities of plantation slavery and Cthulhu’s minions. Set in 1837, this homage is a work of historical fiction set in the grim universe of H.P. Lovecraft. Check out the free audiobook read by Alex Murray in podcast or on Youtube! Carolina Reapers straight from their native soil. 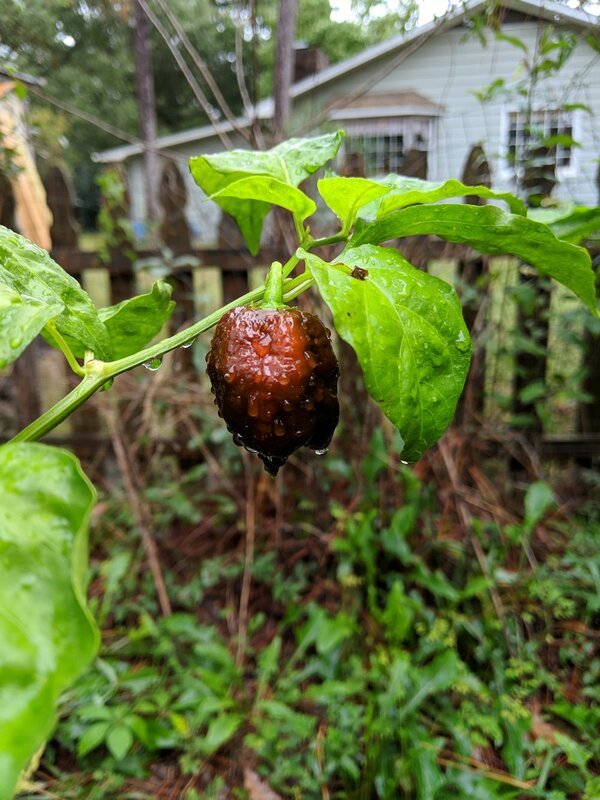 Each year I grow a huge crop of Carolina Reapers in my garden and turn them into delicious hot sauces. These are custom order. Send me an email at kirk@kirkbattle.com for more details. 2018’s hit sauces were Murder Ketchup, Blueberry Ancho, and Curry Bomb! T-shirts can be purchased online through Amazon for many of my books. Just click on an image below! All sizes and genders available.